Glaciers are fascinating formations. They shape our landscape. 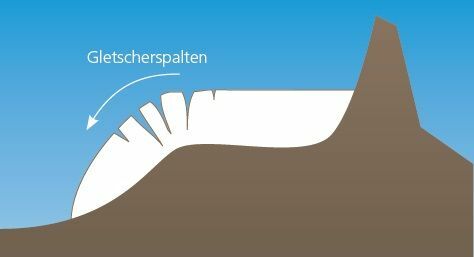 At the glacier we find crevasses, mills, cones, moraines... At station 1 of the ice grotto we want to show you some of these phenomena, which you can see all around you at the Stubai glacier. Further along the way, we will show you how some of these special glaciological formations are created and how glaciers work. On the pictures below you can see some of these glacial phenomena. Glaciers flow towards the valley under the influence of gravity. The annual flow speeds of our alpine glaciers range from a few metres to over a hundred metres per year. The glaciers flow fastest in the steep areas. During summer, the movement is faster than in winter because the melted water reduces friction on the ground, so the ice can slide faster over the glacial bed. If the mass balances are positive, the glacier gains mass, because more snow remains over summer than ice melts at the tongue. The glacier transports rocks that are ground fine between the glacier and earth and form the subglacial till. Larger blocks are enclosed in the ground rock. If the glacier melts, the moraine remains. The glacier grinds the rock into a fine flour. The sediments give the glacial streams their characteristic colour. The milky cloudiness of the glacial runoff has led to the term ‘glacial milk’. Each month, several tonnes of sand are transported into the glacial streams. For instance, suspended loads of between 150,000 and 240,000 tonnes per month were measured in the Ruetz river. This corresponds to around 10,000 to 20,000 HGV loads. The glacier surfaces in the ice grotto are not pure white or transparent, but instead partly interspersed with crushed gravel, rocks and bubbles. You can find out why that is here. The melted water creates channels in the ice. If these pass vertically through the ice, they are referred to as glacier mills.These channels can freeze over or be filled with sediment and or rocks, as shown in 5-1. The snow that falls at the glacier is compacted within several decades to form glacial ice. The air contained in the snow and firn is enclosed in bubbles, which can be seen in the glacial ice. Virtually bubble-free ice is created in the spring, when melted water freezes again at the supercooled ice surface. This gravel appears to be unsorted. It is probably a former supraglacial (= at the surface of the ice) deposit which was also dumped by the ice movement. This vertical sand layer was originally transported with the melted water in the glacier and stored horizontally in a well. The structure was tipped up by the movement of the ice. As part of the excavations at the ice grotto, the Institute for Interdisciplinary Mountain Research at the Austrian Academy of Sciences took ice samples. One sample contained fungus spores. These were transported to the Schaufelferner by the wind more than 100 years ago, deposited in the snow and enclosed in the glacial ice. Time and time again, dust from the Sahara is transported by the wind in the Alps, deposited at the glacier and stored in the ice. Beetle mites and other arthropods are often transported to the glacier by the wind and enclosed in the ice. In the glacial areas that do not flow, very old relics can survive (e.g. Ötzi the Iceman for 5,000 years). The ice in the cave shows seasonal stratification: in summer, the melting creates a dark layer that contains dust and sand, which is blown onto the glacier over the summer. The winter layer is light-coloured. The temperature at the glacier is constant at 0°C. This is why the temperature in the ice grotto seems cold to you in summer and warm in winter. In addition, every visitor gives off heat (100 watts) and thus warms the air in the ice grotto. When ice contains lots of air bubbles, it looks white. Blue light can penetrate furthest into the glacial ice. 25% of the blue light is still present behind an ice layer one metre thick, but only 1% of the red light. 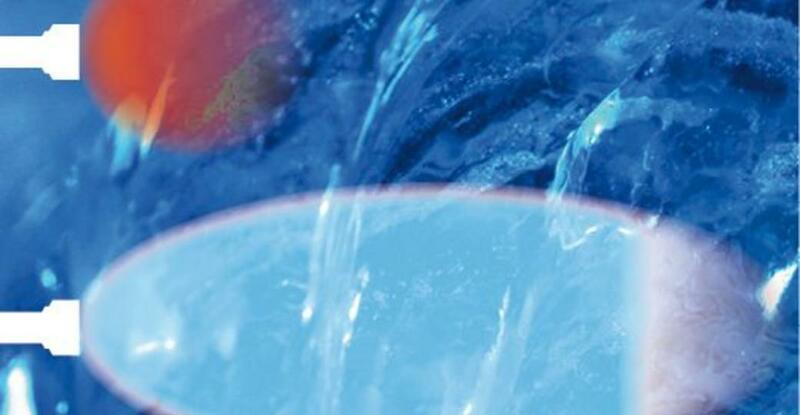 As the red light is absorbed fastest, the ice appears blue. Please take the lamps at station 9 and light up the ice once with the red light and once with the blue. See for yourself the visual properties of the glacial ice. The glaciers have been retreating over recent decades. 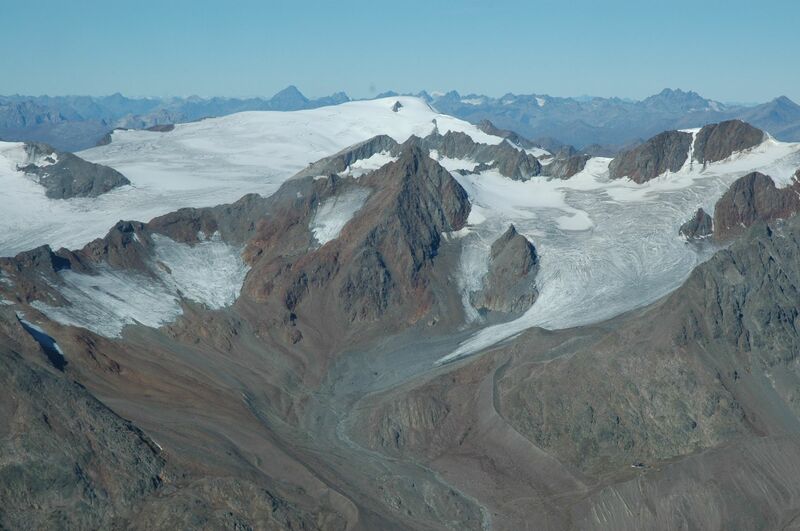 The Stubai Glacier has done well, as it was one of the first to enjoy the pioneering work of active glacial protection. During the early years of the third millennium, scientists and practitioners considered how to prevent melting at particularly problematic areas or at least significantly slow it down. Using the ‘ablation cones’, where a block of stone protects the ice pedestal against ablation on sunny days, they came upon the idea of covering the blanket of snow with fleece. However, the protection measures for the glacier are very costly, as they demand a large workforce and a lot of working hours. A special unrolling and rolling machine was designed for the fleece, which is laid over an area of ten hectares at the Stubai glacier in the spring and weighed down with sand bags. Nevertheless, eight members of staff and two snowcats are employed for a month in the spring to spread the fleece and three weeks in the autumn to remove it. The white fleece is around five millimetres thick, tearproof, weatherproof and can be reused economically for up to three or even four seasons, but it also has its price and needs to have its own special storage facility constructed. In total, glacier protection costs a few hundred thousand euros a year, which are paid without exception by the glacier railways. However, the investments are justified, as the glacier and ski operations thus have no need to be anxious about their future. The bedrock is polished by the glacier that flows above it and the rocks carried in the ice. The rock affected by the glacier has an unmistakable appearance and is referred to as glacial polish. The characteristic scratches in the rock are called striations. How pieces of rock can also be broken off. Using these traces, it is possible to determine the flow direction of the ice for Ice Age glaciers. An especially fine sediment is created when the rock is ‘polished’. This gets into the melted water and leads to the characteristic cloudiness of the glacial runoff, which is also referred to as ‘glacial milk’. Find out more about glacial milk at station G 4. The image below shows the changes to the Schaufelferner since 1850. At this time, the glacier reached its greatest expansion since the last ice age. This image clearly shows the side moraines after the last glacial expansion in 1850. Numerous impressive side moraine embankments still indicate this glacial peak. Among other places, you travel over a particularly clear example in the gondola in the 2nd section of the Eisgrat railway. At the height of the last ice age around 20,000 years ago, the Alps were covered with ice up to the great lakes in the foothills of the Alps, with only the highest peaks protruding. 10,000 years ago, it became warmer and the glaciers in the valleys melted. The glaciers that remained were of a similar size or smaller than those today. The Little Ice Age around 1250 led to cooling, and so the glaciers reached a peak within the last 10,000 years in 1850. Since then, the glaciers have been retreating, interrupted with brief advancements in 1870, 1920 and 1980. The illustration shows the postglacial temperature development in the Eastern Alps region. The glacial expansion determined so far and the forest and tree lines were used to determine the development of the summer temperature (May-September) for the last 11,000 years. In over 65% of this time, the temperatures lay above the mean of 1980-90, which are the red areas in the graph. Glaciers are created where snow does not melt for several years. It remains on the ground and turns into glacial ice over several decades. The fluffy snow weighing 300 kg/m³ is compressed in a year into firn weighing 700 kg/m³. Compression then continues slowly until, after around 30 years, the final stage ‘ice’ is achieved, weighing 917 kg/m³. Under the influence of gravity, the ice is shaped and in constant movement. The glacier thus moves several metres a year towards the valley. In some places, the forces are so great that the ice cannot react with plastic deformation, such as at the edge of the land and over rock hummocks in the ground. Then cracks form, called crevasses. The melted water creates channels in the ice. At the surface, melted water forms a meandering stream, which reaches the ground via the glacier mills (vertical channels in the ice) and then emerges again at the mouth of the glacier. At the glacier tongue (= often tongue-shaped, lower part of a glacier), up to 10cm of ice melts on a hot summer day. Several metres of ice can melt throughout the summer (= ablation zone). At the higher regions of the glacier, the snow remains throughout the year (= accumulation zone). The glacier in front of which you are standing is the Schaufelferner. ‘Ferner’ is a Tyrolean term meaning ‘glacier’. 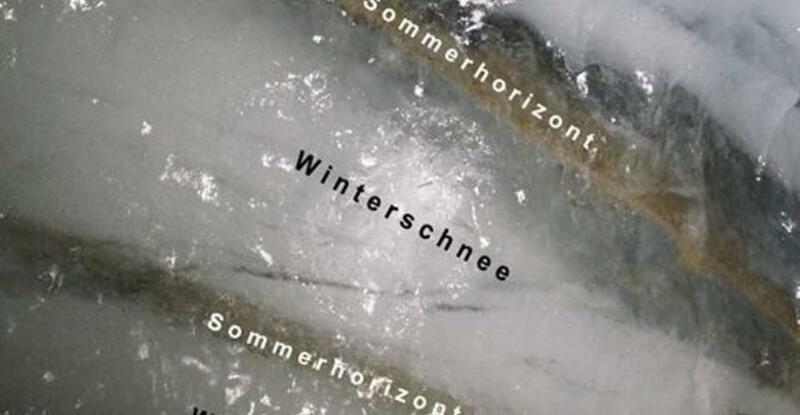 The ice of the Schaufelferner is up to 70m thick.